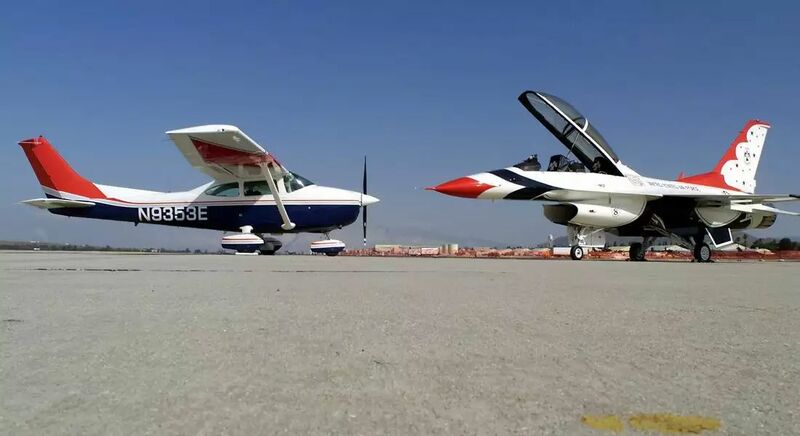 CAP Cessna 182 Slylane (L) opposite USAF Thunderbird F-16 Fighting Falcon. 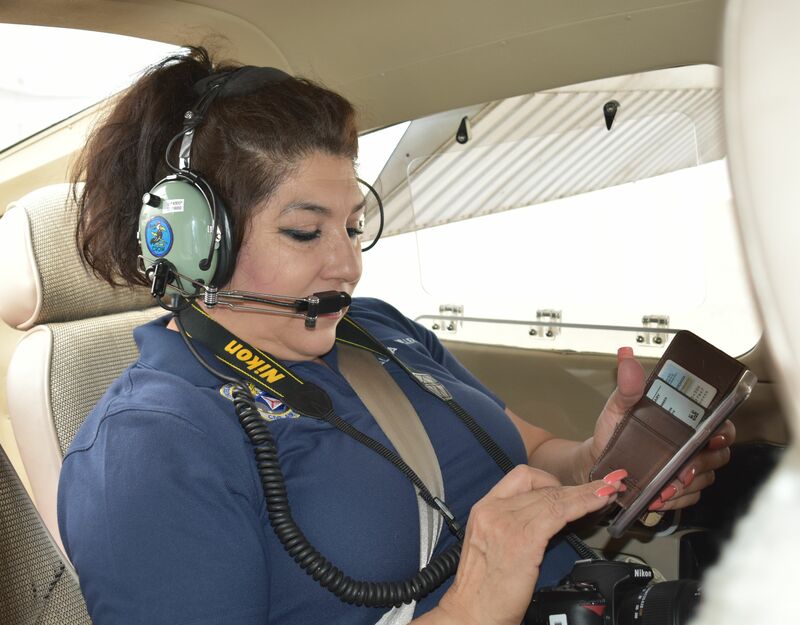 FASF Treasurer, and native of Casas Grandes, Mexico, America’s first foreign air base (in 1916), Alma Villezcas, took to the sky for her first SAREX (Search And Rescue Exercise) this past weekend out of the Las Cruces, NM Municipal Airport Civil Air Patrol (CAP) facilities. Ms. Villezcas joined the Las Cruces CAP Squadron 24 a year ago with the intention of learning to fly with the CAP, which is a full-fledged Auxiliary of the United States Air Force (USAF) – (see Air Force photo above with the two USAF Aircraft: A CAP Cessna and F-16 Jet Fighter), which supplies all of the facilities and equipment, including costly modern aircraft, to each Squadron throughout the U.S. For this reason the CAP uniforms are based upon the USAF’s. 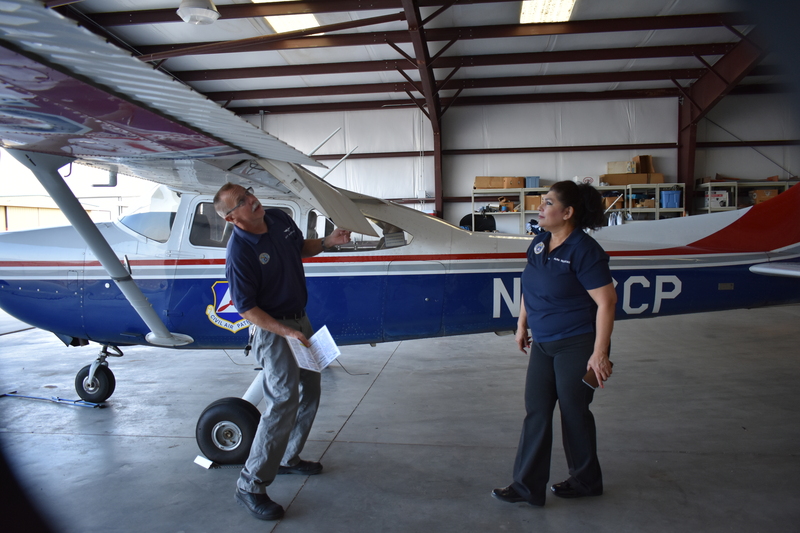 Mission Pilot, Dave Bjorness (L), and Scanner Trainee, Alma Villezcas (R) in the process of conducting their Preflight Inspection of the CAP Cessna Skylane prior to the Mission . . . All photos in this story may be seen in full resolution by simply clicking on them. 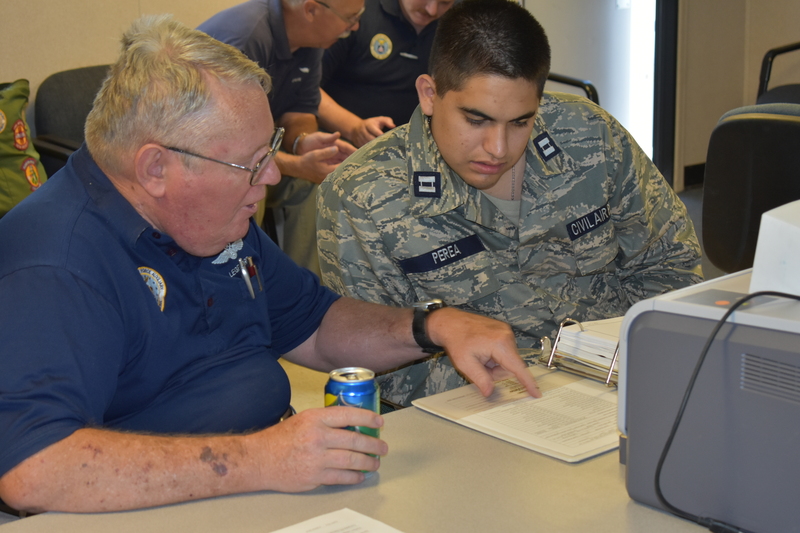 The origins of Civil Air Patrol date to 1936, when Gill Robb Wilson, World War I aviator and New Jersey director of aeronautics, returned from Germany convinced of impending war. Wilson envisioned mobilizing America’s civilian aviators for national defense, an idea also shared by other aviation activists. In Ohio, Milton Knight, a pilot and businessman, organized and incorporated the Civilian Air Reserve (CAR) in 1938. 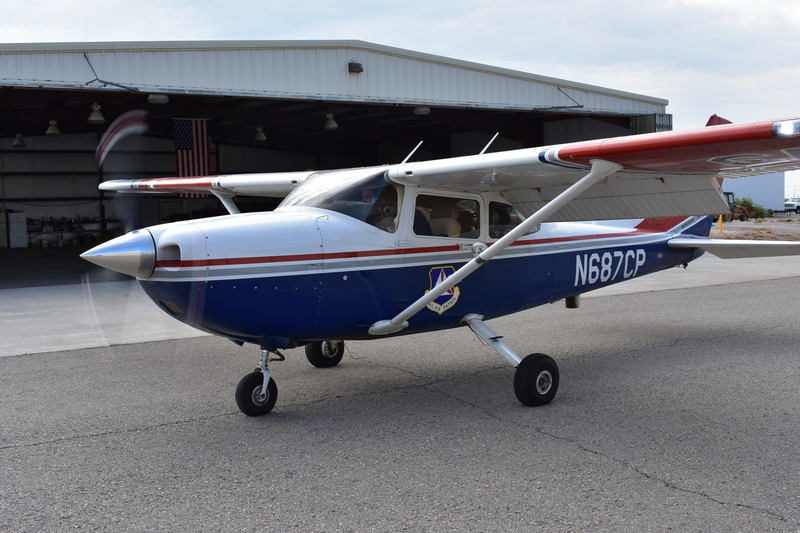 Other military-styled civilian aviation units emerged nationwide and helped train pilots for defense of the homeland. Their proposal for a Civil Air Patrol was approved by the Commerce, Navy, and War departments in November, and CAP National Headquarters opened its doors on Dec. 1, 1941, under the direction of national commander Maj. Gen. John F. Curry. Existing CADS, CAR and other flying units soon merged under the CAP banner. 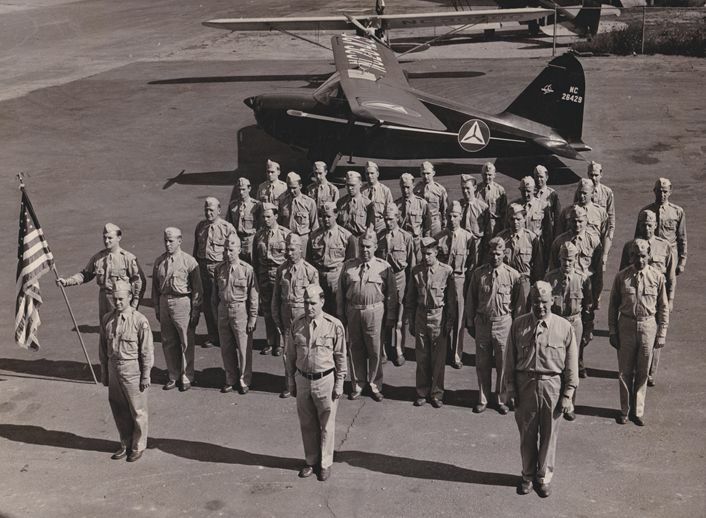 Public announcement of CAP and national recruiting commenced on Dec. 8, 1941, the day after the Japanese attacked Pearl Harbor..
CAP Personnel in military formation in front of one of their Stinson Patrol Aircraft in 1942. 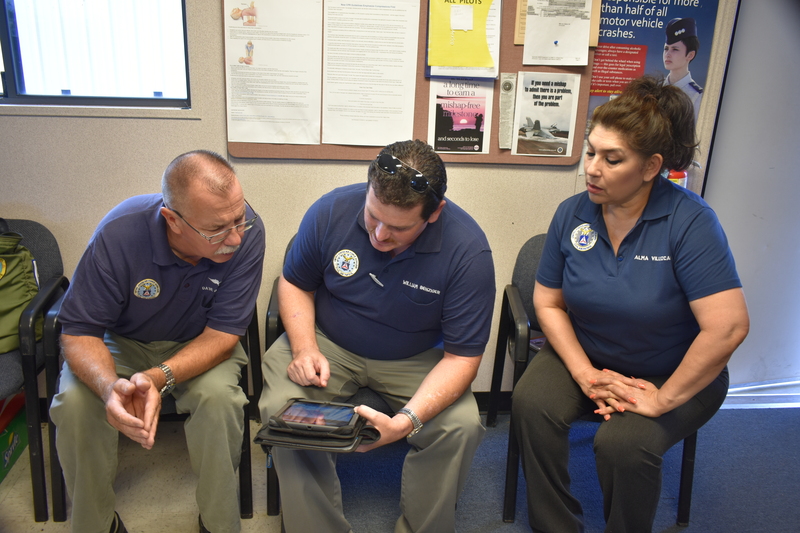 L to R above: Mission PILOT, Dave Bjorness, Mission Commander and Flight OBSERVER, William Benzinger, and Alma Villezcas, Mission SCANNER Trainee, briefing about their tasks and esponsibilities before their Mission. Above, Alma readies for the Mission, which will entail scanning for a downed aircraft and taking hi-resolution color photographs of it and the surrounding terrain for ground rescue agencies’ guidance. Above, Alma checks out her Intercom equipment, as flight crew readies for engine startup. She has already opened the side window’s Camera Port. The High Resolution Professional Digital Camera must shoot all photos through this open window so that no window reflections nor glare interfere with the photo’s high quality. The aircraft has started its engine and begins to taxi out for take off. The CAP Squadron’s main hangar is in the background above. 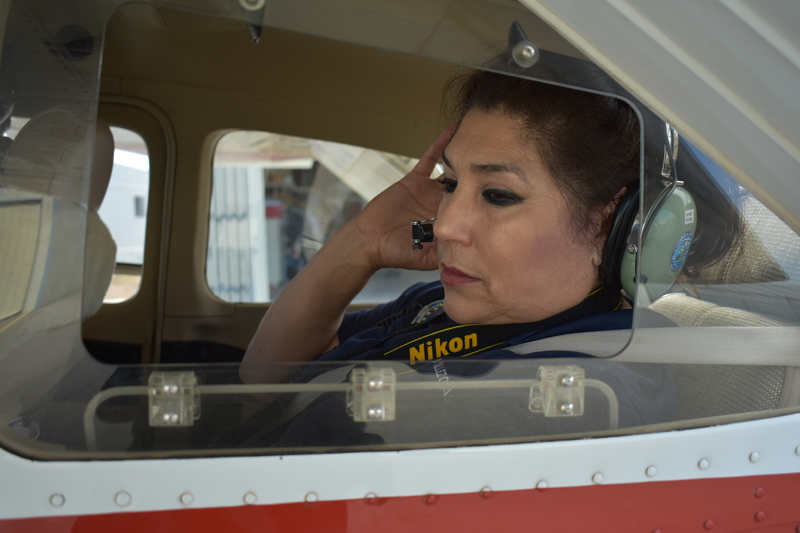 Alma and her crew returned safely from their successful 2 hour long SAR Mission Exercise, having finally located the simulated downed aircraft and also it’s ELT (Emergency Locator Transmitter) radio signal. The following 7 minute video gives a moving glimpse into what Alma experienced during her very first CAP Training flight. This entry was posted in AVIATION NEWS, HOT NEWS!, NEW VIDEOS and tagged Alma Villezcas, Auxiliary of the U. S. Air Force, CAP History, Casas Grandes Mexico, Cessna 182 Slylane, Dave Bjorness, December 1 1941, Downed Aircraft, ELT, Emergency Locator Transmitter, FASF Treasurer, G1000 Glass Panel Avionics, Gil Robb Wilson, Joe Parea, Las Cruces NM, Mike Legendre, NM Wing CAP Squadron 24, Observer Training, Pilot Training, Post Flight Debriefing, Pre-Flight Briefing, Radio Communications, Ric Lambart, SAREX Mission, Scanner Trainiing, Search and Rescue Training Mission, USAF, William Benziger on July 30, 2018 by FASFRIC.